Like many Lagosians, I welcomed the determination of the Federal High Court in Lagos late September stopping LASTMA - the Lagos State Traffic Management Agency from issuing fines to traffic offenders. Unlike many Lagosians, I do not question the legitimacy or the need for LASTMA, I will even go further to agree with the Lagos State Governor, Babatunde Fashola who said "LASTMA is a local solution to a unique traffic problem." However, this is where my support for the Governor's statement ends. Although I believe LASTMA can be a force for good in traffic management, it appears that, just like the Nigeria Police 'Force' it has evolved to become a force of oppression and misery for unwary motorists. I have had a few encounters with LASTMA and I have come to the realisation that it is an institutionally corrupt agency with little or no training for its staff to effectively manage traffic in a so-called megacity. On one occasion, I turned left at a T-junction in Victoria Island and was immediately accosted by a LASTMA team that almost drove into me from the wrong side of the road. They had apparently been waiting to 'catch a prey'. When I questioned why I was stopped, they shouted at me "didn't you see that you should not have turned left at that junction." When I asked for the sign, one of them pointed at a rather small pole. I insisted we walked to check the pole. When we got to the pole, the sign on it had faded, and no one could be reasonably expected to decipher what it says. Little wonder I didn't notice it. I asked again 'Where is the sign and what does it say? When they maintained their position, I whipped out my phone and took a picture of the non-sign. Seeing the handwriting on the wall, one of them just said to me 'Go.' I walked calmly but triumphantly back into my car and drove off with two of them perplexed as to what had happened. I have no doubt they stayed behind to continue the harassment and extortion of other motorists. The second encounter was even more unjust. I found myself driving behind a waste truck that appeared to have stopped moving;after a few minutes, I proceeded to overtake it only to find out it was queuing for the turn that I also needed to make. I indicated to go back on the lane and incredibly enough, the vehicle beside me gave way. I was back on the lane and we were at least 300 yards away from the turning. A LASTMA official approached me and I explained what had happened, and he waved me away removing the set of nails he had placed before my car tyres. A few seconds later, another LASTMA approached and I wound down the window to explain to him that I had cleared with his colleague. This was a mistake on my part as he dipped his hand into the car, unlocked it and jumped in. He also opened the back door for his colleague to jump in. They then ordered me to drive on. The one seated beside me was reeking of alcohol. It was getting late, I was tired, hungry and looking forward to going home. I was dejected and knew that though I had not contravened any traffic laws, I was at the mercy of these two hoodlums. I drove on but decided I was not going to their destination, I drove past where they asked me to turn, they struggled with the handbrake whilst in motion, pulling it up. I kept pushing it down and refused to stop. It was almost like a thriller and I could not believe I was the lead actor. I drove on until one of them started to talk nicely to me. At this stage, I was near my estate and I knew I was in safe territory, so I stopped. The one in the front passenger seat turned off the ignition, grabbed the key and stormed out of the car. They both soon realised the game was up and gave my key back begging that I gave them money to get back to where they came from. I was not having this and I drove off determined to teach them a lesson. Coming back to the judgement of the High Court and Governor Fashola's statement. Yes, it is good to use a local challenge to create opportunity for almost 5,000 people, I would rather they are properly trained and monitored to stop them from terrorising motorists. I hope the Governor is not surreptitiously inviting us to applaud him for doing what he was elected and paid to do? I have no doubt that, in the Governor's words, some elements of LASTMA "are working showing dignity of labour, staying in the sun and in the rain working for all of us." I suppose they are not any different from other Lagosians who carry out their work conscientiously. In any event that is not the issue here Governor. So don't pull the wool over our eyes by going on the emotional lark, the High Court judgement is not about whether LASTMA officials are doing their work or not, it is about the legality of issuing fines. I would also add, Is it legal to jump in people's cars because of a traffic offence? I have no doubt that many motorists have had worse encounters with LASTMA staff. 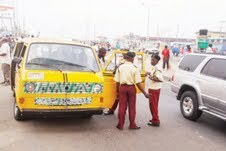 It was reported recently that a motorist was beaten to death by LASTMA officials. I have no doubt that If I had gone with the LASTMA officials to their depot, my car tyres would have been deflated and I would be made to part with money for a spurious offence. So Governor Fashola, please look again into this matter, whatever is what doing at all is worth doing well. The original reason for creating LASTMA is not to create 5000 jobs but to manage traffic well. Well, lets make this happen Governor and stop presenting a dog to us as a monkey. The challenge of leadership is to solve problems. Lets devise a system of enforcing traffic laws rather than jumping in peoples' cars, running after vehicles, beating motorists or setting people up to fail. LASTMA staff need training, they need to be made aware of their boundaries, motorists need to be made aware too of their boundaries. More people will obey the law if they see the government's sincerity. Last word, I believe in LASTMA, but even the Governor knows that you cannot enforce the law with illegality. It's quite unfortunate that when we embrace energy without direction the result is always chaotic,that explains why Yoruba's says that Ogbomosho ju agbara lo.